Whether you’re a Traditionalist, Baby Boomer, Gen X’er, or Millennial, this book will change how you perceive others and enhance your relationships with everyone you know. 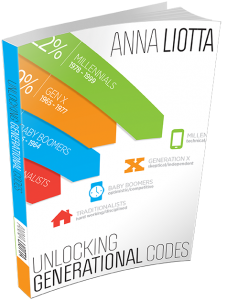 Unlocking Generational CODES© is the key to understanding the people around you—young and old and in between. 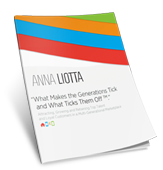 Generational expert Anna Liotta takes readers on a journey of how members of each generation think, behave, and engage. Anna teaches you how to overcome the “generation gap” so you can effectively communicate and develop meaningful relationships with members of all the generations in the workplace and in everyday life. Enter your name and email below to receive a complimentary copy of the first chapter. Over 40,000 copies sold. Individual copies available on Amazon.com. “What Makes the Generations Tick and What Ticks Them Off™” Learn how to create a GENERATIONALLY SAVVY™ OrganizationYou’ll also receive a subscription of our newsletter. You may unsubscribe at any time. © 2019 Anna Liotta - All Rights Reserved.